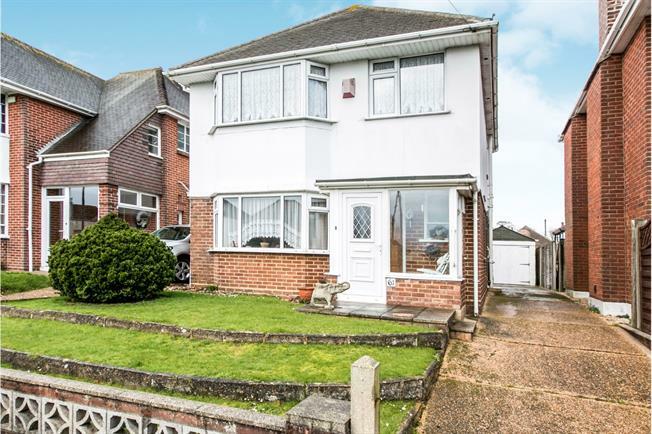 3 Bedroom Detached House For Sale in Bournemouth for Asking Price £350,000. VACANT POSSESSION - Palmer Snell are please to offer this 3 bedroom detached family home with 2 reception rooms situated in a popular residential location in Muscliff close to the Epiphany School. The property requires modernisation and comprises a porch, entrance hall, downstairs WC, 13'6" lounge, 12' dining room, 10'11" conservatory, 9'8" kitchen leading into a breakfast room, 3 first floor bedrooms, bathroom, UPVC double glazing, gas central heating, parking in the front, garage and rear garden. Through porch via UPVC double glazed door. Radiator. Stairs to first floor landing with cupboard under. UPVC double glazed window to side aspect. Doors to accommodation. Frosted window to front aspect. WC. Window and door to conservatory. Radiator. TV point. Gas fire in surround. Wall light point. Arch through to dining room. UPVC double glazed bay window to front aspect. Radiator. Space for table and chairs. Brick base. UPVC construction. Door to rear garden. UPVC double glazed window and door to side driveway. Range of wall and base units. Sink. Space for appliances. Larder cupboard. Tiled walls. Arch through to breakfast room. UPVC double glazed window to side aspect. Loft hatch. Doors to accommodation. UPVC double glazed bay window to front aspect. Radiator. UPVC double glazed window to rear aspect. Radiator. Airing cupboard. Frosted UPVC double glazed window to rear aspect. WC. Wash basin. Bath with shower over. Tiled walls. Radiator. The front of the property is laid to lawn with driveway to the side allowing off road parking leading to the rear garden and garage. The rear garden has a patio off the with the remainder laid to lawn. Flower beds to the borders.